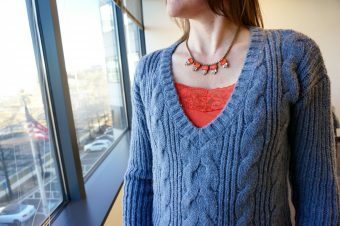 This is the first post in a 10 part series on how to wear the Pantone Seasonal Colors. For posts on the other colors visit the Pantone Seasonal Color Page. I am torn between Pale Dogwood and Flame as my two favorite color choices for the season. The Pale Dogwood is so subtly beautiful and universally wearable that I might have to give it a slight edge. The only challenge I have with this color is that it can provide a washed-out appearance if you are fair skinned like me. By contrast though, it coordinates with so many colors, it really could be considered a neutral base to build from. In the shirts below, see how Pale Dogwood pairs nicely with anything from warm neutrals to cool brights whether there is a little or a lot. It also pairs nicely with many of the other season colors (shown below with Lapis, Niagara, Greenery, Hazelnut and Primrose Yellow). If you are looking to add more Pale Dogwood into your wardrobe – hands down – the best place to look is AllSaints. When it comes to solid Pale Dogwood, they have tons of options as this is one of their staple colors. I highlight a few of the more wearable items below. I am personally drawn to the wool coat as a great transition piece for spring and warmer weather. The picture doesn’t really show the high side slits which provide interesting lines in a purposely oversized coat. Another good option is to purchase the Aleida set (Blazer and Pants) for a great suit to carry you into spring. The lines are classic so the pieces will be timeless. The picture doesn’t show the side splits making this a perfect transition coat. On sale! Pair this with a patterned top for more pop or neutral for a more subtle look. The perfect accompaniement to the Blazer or wear alone with a patterned top. This dress stands alone with the neckline and ruffled hem. Layer with a turtleneck for a more office and/or winter appropriate look. Pair with a pencil skirt, the pants or over one of the dresses. The funnel neck and flared sleeves make a statement on their own. Pair this with a black suit jacket until spring. Beautiful and on sale!